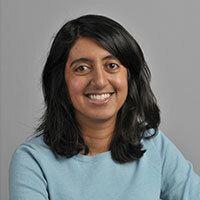 Seema Jayachandran is an Associate Professor of Economics at Northwestern University. She is also an affiliate of the National Bureau of Economic Research, Bureau for Research and Economic Analysis of Development, Abdul Latif Jameel Poverty Action Lab, International Growth Centre, and Innovations for Poverty Action. Dr. Jayachandran earned a Ph.D. in economics from Harvard University, a master’s degree in physics and philosophy from the University of Oxford where she was a Marshall Scholar, and a bachelor’s degree in electrical engineering from MIT. Prior to joining Northwestern, she was an Assistant Professor of Economics at Stanford University and a Robert Wood Johnson Scholar in Health Policy Research at the University of California, Berkeley. She also previously worked as a management consultant with McKinsey & Company. Dr. Jayachandran’s research interests span a wide range of topics in development economics. Much of her recent work focuses on maternal and child health in Africa and South Asia. She has also made contributions related to political economy, labor markets and environmental conservation in developing countries.